Christopher Gadsden led the Sons of Liberty in South Carolina starting in 1765, and was later made a colonel in the Continental Army. In 1775 he was in Philadelphia representing his home state in the Continental Congress. He was also one of three members of the Marine Committee who decided to outfit and man the Alfred and its sister ships as a personal responsibility. Gadsden and Congress chose a Rhode Island man, Esek Hopkins, as the commander-in-chief of the Navy. The flag that Hopkins used as his personal standard on the Alfred is the one we now call "The Gadsden Flag." "Col. Gadsden presented to the Congress an elegant standard, such as is to be used by the commander in chief of the American navy; being a yellow field, with a lively representation of a rattle-snake in the middle, in the attitude of going to strike, and these words underneath, 'Don't Tread on Me!' "
Unofficial usage of the Gadsden flag by the U.S. government has been seen, particularly in the wake of September 11, 2001, most notably by the Customs Service and harbor patrol boats in U.S. ports and individuals serving abroad in the U.S. military. The First Navy Jack, which was directly related to the Gadsden flag, has also been in use by the U.S. Navy, and since the terrorist attack on the World Trade Center towers and the Pentagon, on all active naval ships. 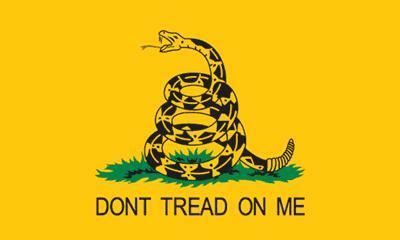 Beginning in 2009, the Gadsden Flag has become an adopted symbol of many of the American Tea Party movements. 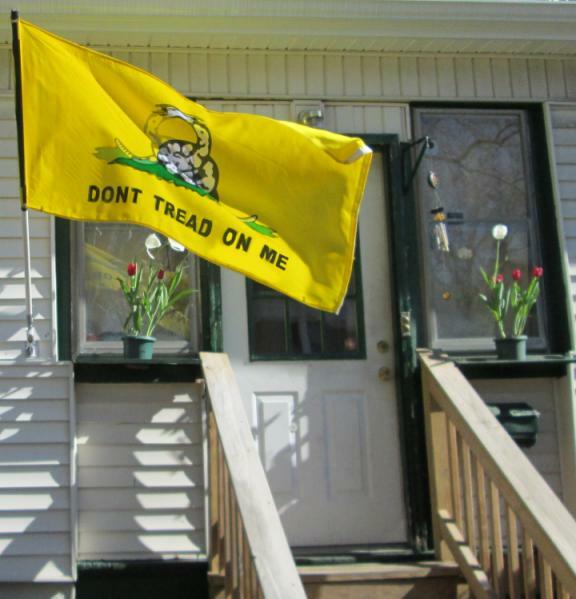 Many Tea Party members have embraced the "Don't Tread on Me" flag and its message. It serves as an alternative to the stars and stripes for Tea Party protesters upset at the current government yet still feeling patriotic. It has also been seen being displayed by members of Congress at Tea Party rallies. And did it very well..."
By doing nothing, and doing it very well, Congress has managed to begin cutting our national spending. Thus my Gadsden Flag will fly until they either cave in and get rid of the Sequester Cuts, or until all of the Sequester Cuts have taken place (fat chance!). Meanwhile, keep your eye on the debt clock to see how much we owe. As the one and only member of the East Orange Tea Party, I have declared the month of April to be "Tea Party Month" in East Orange, and will fly my Gadsden Flag from April 1st to April 15th as a protest against the rising tax rate in East Orange and the failure of the current mayor to carry out his campaign pledges to lower taxes. Instead he raised our property taxes two years in a row, and intends to raise them until 2017, at which point, if the citizens of East Orange have had enough, they will vote him out of office for his failure to keep his word. 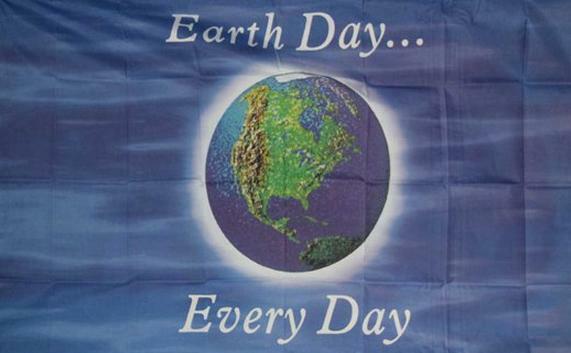 From April 16th to April 30th I will be flying the Earth Day Flag. This has nothing to do with climate change or global warming or cooling or any of that pseudo-science guesswork. This has to do with something REAL that we humans have caused with no doubt about it- pollution. We are the masters of polluting our environment wherever we choose to live. We have been doing it since humans first became "civilized" and our garbage from prehistoric times is what archeologists get paid to collect and study. Only now we can produce more garbage and litter than ever before, and THAT is what we should be correcting. Recycling is only part of the answer, and we need to seriously get involved in cleaning up our own environment before we worry about tampering with global ecology.